The Advocacy and Lobbying group the American Federation for Children founded by Secretary of Education Betsy DeVos’ billionaire family is a 501(c)(4) group that calls itself the leading school choice organization in the nation. According to its official website it is also affiliated with the political committee American Federation for Children Action Fund that supports as well as opposes candidates at the state level for an elected office. The AFC has lobbied for choice programs for years and now that Mrs. DeVos is the secretary of education it continues to. 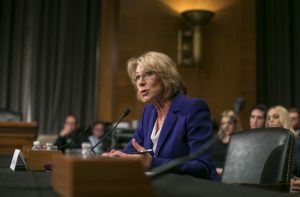 It has lobbied Congress as well as state legislators in 2017 to push for more programs of school choice, specifically for extending the only school voucher program that is federally funded in the nation, the one that is in Washington, D.C. The organization’s lobbyist Michael Musante filed a report to Congress in 2017 saying he earned close to $20,000 lobbying on behalf of the group for extending the Opportunity Scholarship Program in D.C., which helps over 1,100 students of low-income families attend private schools. Secretary DeVos has strongly supported the program, which has authorization through the 2019 fiscal year. The report by Musante said the group was looking for a program extension of five years. On Monday, a report was released that said Congress was likely to extend the voucher program another five years that would be included in the budget deal, which is bipartisan. Lawmakers did not seemed fazed by a new report which found students in the voucher program in D.C. did not do as well as those who applied for but did not receive a voucher. Last January, the then American Federation for Children communications director Matt Frendewey joined the Department of Education as its spokesperson, and denied that the group coordinated with the Education Secretary DeVos to have supporters attend her confirmation hearing with the Senate during February. DeVos was given bad reviews for performance at those hearings for the inability to answer any questions related to basic issues of education. In a number of emails, the organization made offers to fly guests to D.C. for the hearing, asked that they carry out media interviews supporting DeVos’ nomination, gave talking points to them and invited them to have lunch with DeVos as well as her husband. Matt Frendewey the AFC spokesperson said a mistake had been made when it was suggested that the invitation had come directly from DeVos herself.